Go Mordecai! 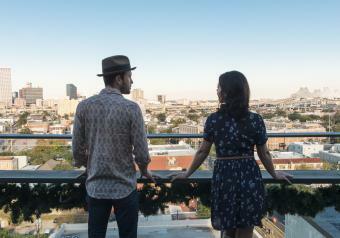 is an exciting and eclectic husband/wife indie duo based out of Los Angeles, CA. Lush orchestral strings, vintage drum machines, and stacked gang vocals all create the perfect environment for lead-singer Rory Sullivan to play and thrive in. Their songs have been featured several times on MTV’s Teen Mom OG, and their latest single titled JUST HAVE FUN showcases the unmistakably fun-laden pop+rock mix that has been keeping their name a buzz since their 2017 single “Here I Go”. “We’re continually writing new songs every week because we love the process of creating together and sharing it all with the world." Always taking inspiration and hitting the ground running, Go Mordecai! presents a diverse collection of spirited songs, filled with uplifting vibes and an adventure for the heart.